In February of 2012 (updated in our report The Arab Spring and Climate Change in 2013) we wrote about drought and natural resource mismanagement in Syria in the past decade, the displacement of about 1.5 million Syrian farmers and herders from 2006-2011, and the role climate change may have played. Our conclusion was that a combination of factors, including the Assad regime’s criminal mismanagement of land, water and food resources (and the subsequent displacement of peoples), an extended period of winter drying since 1973 (linked to climate change by a NOAA report in 2011), culminating in a severe five-year drought, contributed to the collapse of farmland and rangeland that led to this humanitarian crisis. We also concluded that more research was needed to further disentangle the lines of causality for this disaster, and how it might have contributed to the Syrian uprising. That research is beginning to trickle in with the publication of two recent peer-reviewed articles. The first article, from Francesca de Châtel in Middle Eastern Studies is titled “The Role of Drought and Climate Change in the Syrian Uprising: Untangling the Triggers of the Revolution.” Based on significant field work, the article expertly explores the complex interplay of factors that contributed to the uprising in Syria, including the regime’s failed economic policies, sectarian grievances related to favoritism displayed by Assad’s Alawite-dominated government, demographic dynamics, over-grazing of land by herders, unsustainable water use and groundwater extraction practices, and the regime’s failure in handling a humanitarian crisis driven by severe water insecurity. Adding value to the literature on the subject, de Châtel highlights a recent body of conservation research conducted in the Talila Nature Reserve by Serra et al in central Syria, which demonstrates that at least in that part of the country, grazing livestock may be more responsible for vegetation decline than drought (though it should be noted that central Syria was one of the least affected during the 2006-2011 drought). We agree that the focus of attention should be on the mismanagement of natural resources by the Assad regime – especially given how seriously deficient the Syrian government was in this respect (and especially compared to some of its neighbors, such as Jordan, who also experienced serious drought during this time period). However, evidence of poor risk mitigation by governments (as is the case with Assad) does not negate the possible severity of those risks (in this case, drought and climate change). In truth, a large body of recent climatological research, as detailed in the Working Group I report of the IPCC’s Fifth Assessment, quite explicitly discounts that assessment. The data on observed climatic changes and its effects on extreme weather events such as droughts is there, and it’s strong. And the models are strong too. Dismissing them is similar to dismissing studies that show a strong correlation between smoking and cancer, on the basis that direct causality is not 100% provable due to the complexities of the body and the environment (as indeed many in the tobacco industry argued for some time). It’s a generally baseless argument regarding the climate science that doesn’t belong in an otherwise strong article. In the face of aforementioned data which shows a dramatic drop in Syria’s winter precipitation from 1973-2010, conclusions of Working Group I of the IPCC’s Fifth Assessment Report, which includes a solid body of peer-reviewed research demonstrating significant observed and projected increases in drought days in the Middle East, and recent studies by both Skaf and Mathbout and Romanou andTselioudis , it is difficult to declare climate change irrelevant to Syria’s recent or future water woes, or less of a “real” problem than other concerns. And far from distracting from “future water management” in Syria, the prospect of a climate-induced decrease in rainfall in the country would arguably facilitate a greater sense of urgency about improving water management practices. Climate change primarily manifests itself through the water cycle. So if water insecurity is a real problem, climate change is a real problem too. 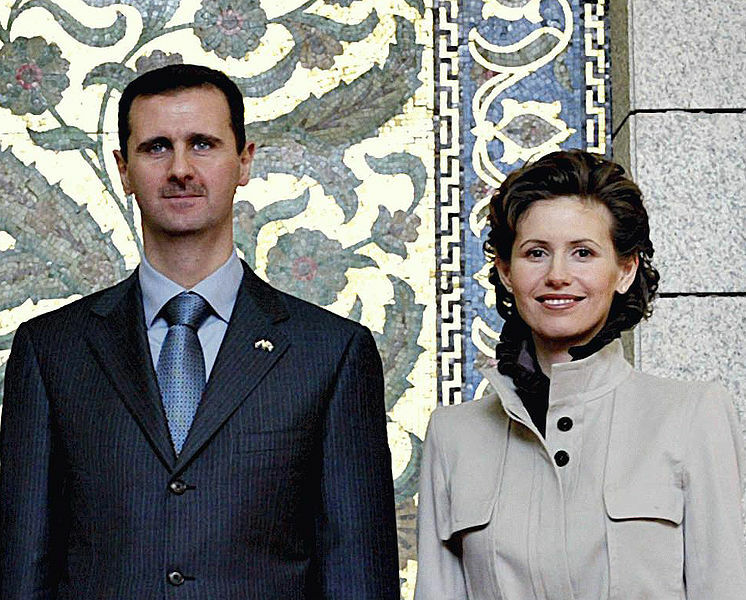 De Châtel rightly expresses concerns that an over-emphasis on the role of climate change could feed the Assad regime’s narrative that external threats, rather than his government, are at fault for the country’s deficiencies. Though it is clear that authoritarian leaders like Assad do not need poorly-understood threats such as “climate change” to justify their actions, it is important to be conscious of the possible real-word implications of a scientific inquiry, particularly when the lives of millions of people are at stake. But de Châtel’s point stands – instability and conflict are incredibly complex phenomena, and researchers (and pundits) need to be careful not to sensationalize one factor or another. Indeed, analysis from policy institutes, including our own – which de Châtel cites in her article – have placed climate change and drought among a mosaic of other social, political and economic factors contributing to the Syrian uprising. In this context, de Châtel’s piece makes a critical, though seemingly commonsensical, assertion: the buck stops with Assad. In a proximate sense, one of the clearest “triggers” of the Syrian uprising is the Assad regime’s failure to provide basic resources for its population during a crisis. After all, the United States, China, and some of Syria’s neighbors, such as Jordan, also experienced significant extended droughts in recent years. Yet none of those nations collapsed as Syria did. The key, as is usually the case, is governance. But governance in the face of rapid and potentially devastating climatic change will need to adapt quickly. As the Tunisian government recognized in its new constitution, building climate resilience into the very heart of governance structures will be a necessity for nations in the 21st century. In conclusion, Francesca de Châtel does an excellent job disentangling the natural resource management factors that contributed to the humanitarian crisis in Syria from 2006-2011, from other political, social and economic dynamics. She makes a strong case that those natural resource management drivers were one of a number of significant factors contributing to social unrest in the “rural and urban” areas of Syria – places that formed the backbone of the Syrian uprising. But in such a strong piece, the inclusion of a poorly-substantiated polemic against further exploring climate change dynamics seems unnecessary. In many ways, recognizing climate change risks may be an impetus for better governance and natural resource management, not an inhibitor. While we didn’t go so far as to claim that those dynamics definitively “spurred violence,” the characterization is otherwise accurate. In conclusion, Gleick’s article does a good job of highlighting the literature thus far assessing the weight of environmental, natural resource management and climatic factors in the recent Syrian uprising, and adds to the discussion through a broader look at the role of Syria’s neighbors, such as Turkey. In all, it’s encouraging to see additional research on this critical question, but there is certainly room for a lot more. Such research will be incredibly important both to societies in transition in the Middle East and North Africa, as they attempt to build freer and more resilient nations, and to those governments and international institutions that are trying to make sense of the significant environmental and demographic changes happening in the world, and what those changes will mean for both their legitimacy and security. By Caitlin Werrell and Francesco Femia in climate and security on March 26, 2014 .